Laclau has developed an original conception of post-Marxist political theory that is grounded on a materialist theory of discourse. The latter is constructed from a range of theoretical and philosophical sources, including poststructuralism, psychoanalysis, linguistic theory and post-analytical philosophy. The centerpiece of this approach is the category of hegemony, which develops Antonio Gramsci’s seminal contribution to Marxist theory, and is in turn connected to a web of related concepts, including articulation, dislocation, the logics of equivalence and difference, political identification, myth and social imaginary. These ideas have informed a number of empirical and theoretical studies associated with the Essex School of Discourse Theory. 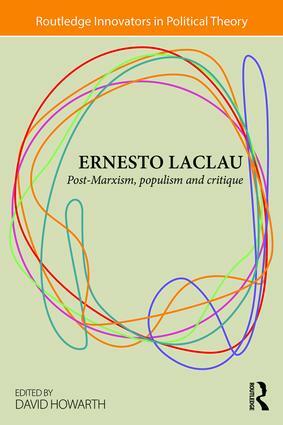 A central concern of Laclau’s writings has been the question of populism, both in Latin America where hebegan his interrogation of the phenomenon (especially the experience of Peronism), and then in his engagement with the "new social movements" and socialist strategy more generally. The concept of populism becomes a general way of exploring the "primacy of politics" in society. Laclau is first and foremost an engaged intellectual who has consistently sought to theorize contemporary events and reality, and to debate with the leading intellectual figures of the day, with respect to questions of political principle and strategy. His recent debates with Judith Butler and Slavoj Žižek in Contingency, Hegemony, Universality: Contemporary Dialogues on the Left, published in 2011 (London: Verso), exemplify this critical ethos. He continues to elaborate his approach by challenging and articulating related approaches, and by situating his work in connection to the democratic Left. David Howarth is a Reader in the Department of Government and Co-Director of the Centre for Theoretical Studies at the University of Essex. Routledge Innovators in Political Theory focuses on leading contemporary thinkers in political theory, highlighting the major innovations in their thought that have reshaped the field. Each volume collects both published and unpublished texts, and combines them with an interview with the thinker. The editorial introduction articulates the innovator’s key contributions in relation to political theory, and contextualises the writer’s work. Volumes in the series will be required reading for both students and scholars of 21st century politics.